Journeying down to Ascot on Saturday, I was staggered to read in one of the previews that the Qipco British Champions Day concept had a “difficult birth” back in 2011. Nothing can be further from the truth. It was a hit from the off, and one of the main reasons was the presence of the formidable Frankel. Now, six years on, Sir Henry Cecil and Prince Khalid Abdullah’s superstar is still leaving his stamp on the great day, this time in the shape of CRACKSMAN, who became the first progeny of Frankel to land a Group One prize in Europe. One of Frankel’s finest performances is widely accepted to be the day he won the Queen Anne Stakes by an amazing 11 lengths at the royal meeting of 2012. Rarely, since then, has a horse devoured Ascot’s home straight with the kind of aplomb Cracksman displayed to take Saturday’s Champion Stakes. Those of us who feared the 3yo, as a relentless galloper who has previously needed plenty of stoking, might struggle to cope with such a relatively short straight at the end of a drop to 10f, were made to eat our words. The colt travelled through the race as well as we’ve seen him and, as usual on these occasions, trainer John Gosden and jockey Frankie Dettori got their strategy spot-on, committing him for home early and allowing his giant, powerpacked stride to do the rest. No wonder Dettori, winning the Champion for the first time in his career, drooled over the improvement Cracksman has found since contesting the Derby in June. That day at Epsom, he finished behind CLIFFS OF MOHER. Here, he thrashed Aidan O’Brien’s colt by 15 lengths. It was breathtaking stuff. Unquestionably the performance of the Flat season, and one that, in my view, would have been good enough to beat stablemate ENABLE and win the Arc three weeks earlier. At the same time, it was one that shed light on the reason why Cracksman didn’t travel to Chantilly. It enabled Gosden and Dettori to scoop both prizes, two of the most prestigious in the programme book, and it kept both owners content too. Anthony Oppenheimer had already tasted Arc glory with Golden Horn only two years earlier, and it might not have been an easy task persuading Abdullah to keep Enable in training as a 4yo if she’d just been touched off by a rival from the same yard! Now, of course, both are set fair for 2018 campaigns, with the frightening prospect of them both extracting even more improvement and also raising the possibility of them duelling against each other in two or three of the keynote middle-distance races. Suddenly, it’s Cracksman v Enable we all want to see, rather than WINX v Enable. Which, of course, underlines how silly the clamour for such matches can look. I wrote after the Arc that if such races happen, they must be allowed to do so naturally, not via the dubious hand of an artificial, self-serving circus-hall promotion. When you’re dealing with horses, form and fitness, or lack of, can intervene to upset the best of manufactured plans. Now you can add the arrival of a third party, a spoiler, a horse just as good, if not better, as happened most famously in 2010 when Imperial Commander came along to spike the much-trumpeted clash between Denman and Kauto Star in the Cheltenham Gold Cup. Cracksman’s crushing triumph was, of course, the highlight of another memorable Champions Day, which is now firmly established as a colossus of the global racing year. The testing ground made life difficult for two or three other big names, but of six favourites, all bar one made the first two, which didn’t make life difficult for most punters, unless, like me, they opposed Cracksman and Long Distance Cup winner ORDER OF ST GEORGE and rowed in with the Godolphin duo, RIBCHESTER and HARRY ANGEL! The surprise defeats for Richard Fahey’s miler and Clive Cox’s sprinter bore similar hallmarks in that both were too keen early on, a trait often found in horses who have had enough for the season and certainly not one required on a stamina-sapping surface. Given that they travelled so enthusiastically, I was surprised both were sent on plenty soon enough. However, Fahey has spoken lucidly about how hard it is to contain Ribchester’s freakish acceleration, while similar tactics were adopted, with devastatingly different results, when Harry Angel won the Sprint Cup at Haydock. Both animals are almost certainly best on much better ground, which inevitably opened up the annual argument about the suitability of such a surface for such a top-class card. I have never countenanced the view that Champions Day is run at the wrong time of year because it might rain. 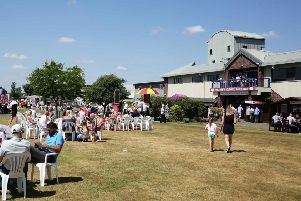 Given the unpredictable muddle our climate is currently wallowing in, the weather might just as easily turn in the middle of summer -- and indeed did so this year, most notably on Sussex Stakes Day at Glorious Goodwood. Equally, the weather might hold in deepest October -- as it has for three of the previous six Champions Days, which have featured Good in the going description. I bet there were no complaints about Saturday’s ground from the connections of Queen Elizabeth II Stakes winner PERSUASIVE (Gosden and Dettori again!) or Sprint winner LIBRISA BREEZE. And as it sits nicely just after the Arc and just before the Breeders’ Cup, it is highly unlikely that the event can be found a new slot in the calendar. Move it further forward and you bump into the St Leger and the Irish Champions Weekend, while also compromising its current status as a seasonal finale. Incidentally, the triumphs of Persuasive and Librisa Breeze added another curio to Saturday in that they were two of three greys to land the six races, supporting the handicap ‘good thing’ LORD GLITTERS. Dean Ivory’s sprinter also reminded the critics that it is still very possible for the smaller yards to rub shoulders with the likes of Gosden and O’Brien. Ivory worked as a mechanic and a welder in his early life, but passed on to him too were the training skills of dad Ken, who holds a very prominent place on the table of my racing memories because once, back in the 1980s, he swept me to glory in a tipping competition by saddling Dawn’s Delight to win on the last day of the season at Doncaster at 50/1! None of O’Brien’s charges are likely to go off at such inflated odds but a review of Champions Day 2017 would not be complete without a nod to his achievement in equalling the world record for the number of Group One winners in a calendar year. The ease with which HYDRANGEA accomplished it for him in the Fillies and Mares actually suggested he’s dropped a rare clanger by running her over much shorter trips for most of the season! However, it’s more like 1/50 than 50/1 now that he will break the record either this weekend or at the Breeders’ Cup the following weekend. And the identity of the trainer he joined at Ascot on Saturday? Why, Frankel, of course. You just can’t keep that name out of the Champions Day lights!